We squeak & float for bath time fun. Colours & shapes stimulate the senses. Helps develop hand-eye coordination. Bathtime fun toys squirt, squeak & float. 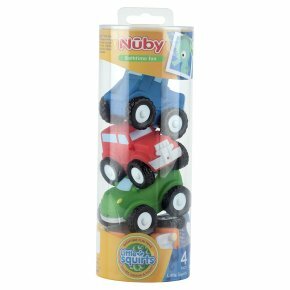 BPA free.This set of 4 Nûby\ Little Squirts\ bath toys are guaranteed to keep your baby entertained in the bath. These fun vehicles squirt, squeak and float in the water. They are brightly coloured and the perfect size for your babies little hands to hold and squeeze. For your childs safety and health. WARNING! Do not leave child unattended. To prevent drowning keep children within arms reach. Inspect before use. Discard and replace at the first signs of weakness or damage. Always check temperature of water before placing child in bath. This product should not be used as a teether. Please read and retain this important information for future reference. Discard all packaging components before giving to child. Clean in warm soapy water and allow to air dry.